For new readers, how about here: Hi, I'm Becky, and when it comes to living donor issues and the potential and compassion living donation represents, and to my brother Joe, I am about as passionate as it gets. You've stumbled on the blog I created in November 2005 as I prepared for the journey of giving a portion of my liver to Joe in 2006. I kept it going throughout that experience, and hope that if my story interests you, you'll poke around for a while. My favorite entries are listed in a section of links at right; you might begin there. Or at the very beginning - I hear it's a very good place to start. * Joe, sadly, is back on the transplant list in Memphis, TN. Our liver is failing and he's suffering, but we are ever hopeful that we'll find a liver that will give him another five years, and hopefully many more. Nonetheless, I'm running through the full range of emotions, landing all too often at anger and grief. And Joe? He never ceases to amaze me. His tenacity, courage, and heart through all of this are constant reminders of what "grace" looks like in human form. I will be blogging here about this new chapter in our journey, starting today. Keep him in your thoughts! * The Greatest Gift Foundation is no more. It was wonderful, we made a difference, we really tried. For those of you who were supporters, please know that while we were up and running, we impacted the lives of hundreds of potential donors and transplant recipients. But in the end, we lacked the resources to give our constituents the service they deserved, or to be able to continue making sufficient progress on the issues to justify asking for our donors' dollars. * The blog from GGF is still live, and still has so much great information -- relevant, informational, inspirational. I'll keep it running in an effort to keep the GGF's mission alive. Thanks for stopping by, and watch for much more now that we're back in transplant land. Chopped Liver fans, I am thrilled to re-direct you to my new blog, the official "day to day on living organ donation" blog of the Greatest Gift Foundation. For lack of a better name, I'm just calling it "the Greatest Gift blog" (yeah, I'm wildly creative like that). The address is http://greatestgift.wordpress.com/. My thanks to Mindy for her help and inspiration on getting it going. Mindy is terrific. Well, the people behind "blogged.com" are obviously enlightened, informed, and marvelous souls, because they have hand-picked Chopped Liver for their list of "great" blogs in their "Health/Condition & Diseases" category, ranking it 25th! Our score of 8.8 out of 10.0 was based on frequency of updates, relevancy of content, site design, and writing style. I take credit for only three of those (I'm just using a blogger template, for crying out loud) but I'll gladly accept the full reward and all the benefits with which it is bestowed. Which, basically, is just a link to my blog from their site, plus bragging rights forever. But hey, beggers and choosers and all that. This Sunday I have the tough, tough task of wining and dining with the American Liver Foundation Minnesota chapter and 200 supporters at the annual Flavors Culinary Gala, an amazing experience where 20 of the Twin Cities' best chefs each host a table for 10 and cook a five-course, wine-paired gourmet meal, table side. Sigh. Someone's got to do it, right? If you'd like to be one of those someones, you can! Tickets are still on sale, and you don't have to live in Minnesota -- the ALF has these Flavors culinary galas in nearly every state. Find your state's gala and other event information at this link. I go for three reasons. First, I've sort of joined the board of the ALF Minnesota chapter. (Yeah, oops. I was bored again.) Second, I love the networking -- 200 people in tuxedos and gowns, holding checkbooks and Amex Platinum cards, each with some reason to care about liver health and organ issues. Where better to drop the words "Greatest Gift Foundation" a few times? And third, well, it's a great cause, planned by great people. Its yummilicious. And best of all, it gives me a chance to wear my expensive Jingle Jangle dress a second time. Amortization, hooray! Attendees also walk away with a CD full of the chef's recipes. I'll post my favorite on the blog next week. A special hello and hurrah to Tara, who is on her way to donating her liver to her step-father, who needs the transplant due to hepatitis and cirrhosis. Like so many of us who discovered we needed a creative outlet to express ourselves during this difficult and exciting time, she has started a blog, called "Liver n Onions," and I've posted a perma-link to it in the right-hand column. Stop by and wish her well! Megan, who's in her mid 20s now, was diagnosed with Hepatitis C in her late teens -- the result of blood transfusions she had as a very young child over a decade earlier. Since then she has suffered from cirrhosis, Crohn's disease, and diabetes. In October, when Cindy first wrote to me, Megan had level-4 liver disease, with AFP levels through the roof; her physicians were certain it was liver cancer. Enter Matt, her brother, who was cleared to be her donor in February. Great news! But on the same day he was approved, Megan's AFP levels mysteriously dropped severely, and her perplexed docs decided not to schedule surgery, at least for now. What kind of news is that?!? For Cindy, Matt, and Megan, it's difficult news -- and I can understand why. On one hand it's a possible miracle that Megan's body is healing itself. On the other hand, it's just another speed bump that causes a longer wait for the transplant she'll ultimate need. She is still incredibly sick, and Matt is ready for the surgery, but everything is stuck in a holding pattern. Any of us who have had to wait a single day for surgery once we know it's going to happen can attest to how difficult this must be for all of them. There are no easy answers for why life throws us these curves. All we can do is stay strong and hope things are unfolding the way they do for some sort of reason. But as Cindy wrote to me, "It is so encouraging that living donation is giving us hope." If you have stories of your own wait or can relate, I'd welcome your comments. And if anyone out there has ever heard of AFP levels suddenly plummeting after several weeks of elevation, please let me know! 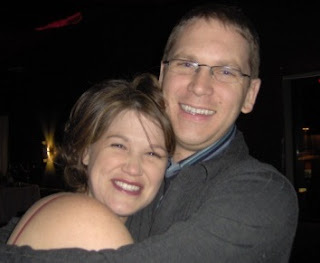 This photo of Joe and me is hands-down one of my favorite pictures ever -- it was taken at the Jingle Jangle fundraiser for the Greatest Gift Foundation on December 8, 2007. As you can see, we're happy! I have covered in the past include pediatric and geriatric HIV/AIDS, breast cancer, down syndrome, ADHD and other behavioral disorders, autism, recovering anorexics and polytrauma in an Iraq war veteran, to name a few. process. The variation from pair to pair would completely depend on the individuals: maybe a donor is proud to show off their scar, while a recipient would want to show only their face in the picture, or vice versa...... The project would show at least some of the donors' or recipients' scars, as this is after all about the human body. In terms of logistics, I am planning to set aside a few studio days in a Manhattan location once I have sufficient number of potential participants lined up. I am hoping to produce this work within the next couple of months, and am flexible when it comes to scheduling appointments for the portrait sessions, which could happen in the evenings or on weekends. In some cases where people might have difficulties coming to the studio, I could potentially set up a backdrop at their house. The participants' surgeries do not necessarily have to have happened recently. In fact, I think it would add an interesting dimension to include the time aspect of how long some recipients have lived with the donated organ as part of the biographical information that will accompany the photographs. For logistical reasons, l am looking for volunteers who will be able to be photographed in the NYC tri-state area, and as part of a pair of organ donor & recipient. As an exception, if someone wanted to participate even though their organ recipient or living donor may have passed away since the donation, I might be able to integrate those cases into the project as well. magazines or newspapers via my agency, Aurora Select. My motivation behind this series is the recurring theme of organ shortages that has cropped up in recent news articles. Creating compelling portraits would, I believe, call extra attention to this pressing issue. Participants would, of course, receive copies of their portraits. In January 2006 I successfully donated half my liver to my brother, Joe. This blog began in November 2005, when I was just a hopeful donor candidate, and continues today as a vehicle for sharing my experience and building community among past, current, and would-be live organ donors and transplant recipients. Thank you for stopping by. All content on this blog, including images and text unless otherwise cited, is copyright (c) 2005-2007, Becky Waller. All rights reserved. In 2007 I founded the Greatest Gift Foundation, which provides information and support to living organ donors throughout their transplant experience. I'm in Minneapolis, when I'm not traveling the country meeting with transplant teams. Contact us at greatestgiftfoundation@gmail.com. Need a break from liver stuff?